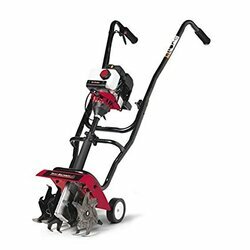 Yard Machines 121R gas powered cultivator Reviews Are you looking for a good gas-powered tiller that will cultivate your land with ease so that you don’t have to break your back doing it? Well, if you look around, you may come across the Yard Machines 121R gas-powered tiller. Is this tiller worth the purchase? By the end of this review you’ll figure that out. This tiller is a moderately sized one that is lightweight enough for most people to handle with ease. It has a pretty powerful engine that runs on gas, and claims to have a EZ-pull start system that makes starting up the tiller less of a pain. The adjustable tines make it possible to change the span of tilled soil area, enabling users to till narrow as well as wider areas of land. This can be very helpful if you are using the tiller for both a garden with flower beds arranged closely and a large empty backyard space, for example. The plow-type handle gives users more control to prevent jumpiness during cultivation. Overall, this tiller seems to be a good one, but what do users have to say about it? Overall, the Yard Machines 121R 31cc 2-Cycle Gas-Powered tiller is an okay product for its price (under $200). If you are looking for a cheap, moderately sized tiller to use on previously cultivated or loose soil, then this tiller is might do the trick. After all, it gets the job done without much trouble in this scenario. However, for those who are looking for a high-powered tiller to break into virgin ground or to use on hard clay type soil, they should steer clear of the Yard Machines 121R tiller. The tiller is also not recommended for those who don’t want a noisy machine.